The Triton Rocket Club (TRC) at the UC San Diego Jacobs School of Engineering set a record this past weekend when they sent their Astraeus rocket soaring 28,000 feet into the desert sky. The flight sets the record for the highest rocket every flown by UC San Diego students. Besides being reaching a record height, this rocket was the biggest, heaviest, fastest, most powerful for TRC. "This design serves as the proof-of-concept for our 10” diameter space rocket, and officially marks the beginning of the home stretch for our launch to space in Spring 2017," said Nico Montoya, a graduating senior and member of the club. "The next step is to fly an 8" diameter rocket to 100,000+ feet which will set the record for highest one-stage college rocket!" Check out the video, and keep scrolling for more photos! Stay tuned for another test on June 4! Last weekend at the TEDxUCSD event, Co-President Yajur Maker and Mechanical Lead Alan Loi of the Engineering World Health Organization presented their Low-Cost HIV Monitoring System. The organization composed of 30+ students focuses on building low cost medical devices for low resource settings, and has currently partnered with the Health Frontiers Clinic to deliver their low-cost Centrifuge, PCR Thermocycler, and Gel Electrophoresis Box to help with monitoring the growing HIV Epidemic in Tijuana. Join us for a symposium and entrepreneur showcase on June 2 to launch the UC San Diego Institute for the Global Entrepreneur. The Institute is a collaboration between the UC San Diego Jacobs School of Engineering and Rady School of Management and is dedicated to training global engineering leaders and translating university discoveries to the marketplace. There is no cost to attend this event, but RSVP is required. The Institute for the Global Entrepreneur encompasses education and training programs, mentoring and strategic partnerships, all working toward a common goal: preparing engineers to become change makers, technical leaders, and entrepreneurs who drive innovation within organizations both large and small. The Institute is a collaboration between the UC San Diego Jacobs School of Engineering and Rady School of Management and is dedicated to training global engineering leaders and translating university discoveries to the marketplace. 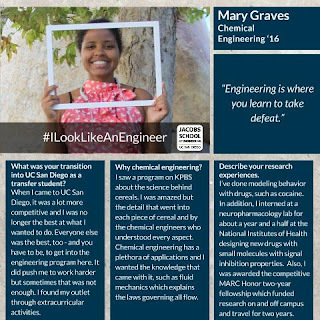 Meet Mary, a graduating chemical engineer who is not only a MARC U-STAR Awardee, but also a Gordon Scholar and has interned at the National Institutes of Health in neuropharmacology. Why chemical engineering at UC San Diego? Let me start by tell you why I chose to study at UC San Diego. During my senior year in high school, I was watching a program on KPBS about the science behind cereals, and UC San Diego chemical engineers who made Fruit Loops could measure and know how much sugar was on each loop. I was amazed but the detail that went into each piece of cereal and by the chemical engineers who understood every aspect. Chemical engineering has a plethora of applications and I wanted the knowledge that came with it, such as fluid mechanics which explains the laws governing all flow. I thought it was amazing and wanted to be involved in food because of it. But then, I also have an interest in biomedical research because my grandmother died of a preventable cause when I was a kid. In addition, my family struggled with substance abuse and medical disorders, so I’ve gravitated toward research questions that will help us better understand why these things happen. What was your transition into UC San Diego like as a transfer student? Transitioning from community college was difficult. When I came to UC San Diego, it was a lot more competitive and I was no longer the best at what I wanted to do. Everyone else was the best, too - and you have to be, to get into the engineering program here. It did push me to work harder but sometimes that was not enough. I found my outlet through extracurricular activities. Can you describe your involvement in different organizations here at UC San Diego? During my time at UCSD I was part of the Academic Enrichment Program (AEP). I was awarded the competitive MARC Honor fellowship which funded research on and off campus and travel for two years. I presented my research at the 2014 SACNAS conference in San Antonio, TX. While at the conference I met the director of summer internships for the National Institute of Neurological Disorders and Stroke. I explained my research interests, long term goals, the research I was presenting and desire to participate in the program. The program has a less than 10% acceptance rate so I did not think I would get in. However, I was accepted. It was a great experience and I would recommend NIH and DC to everyone. The Gordon scholars were a great leadership development program. It prepared me to be an effective and understanding leader through team building exercises and discussions. Being an AICHE officer allowed me to use the skills from the Gordon program. I coordinated events with upwards of 300 participants in an effort to give back to the community and showcase the science behind chemical engineering through demonstrations. I want to go into academia, but there isn’t a lot of flexibility unless you get the grants for it. I’ve done modeling behavior with drugs, such as cocaine and now I’m working with neural modulations. We are looking for correlations to see if people can recall memories. I’m also interested in neuroscience at the intersection between neuroscience and pharmaceuticals. I interned at a neuropharmacology lab for about a year and a half. I was the National Institutes of Health (NIH), working on and designing new drugs. What are three things that make you an individual? I really like hot sauce. Louisiana hot sauce. Jalapeños, habaneros, serranos. Every hot sauce. I have good tenacity and persistence, which is what makes me a good engineer. Engineering is where you learn how to take defeat. A professor of electrical and computer engineering at the University of California, San Diego, has received an honorable mention in the 2015 Doctoral Dissertation Award competition presented by the Association for Computing and Machinery. 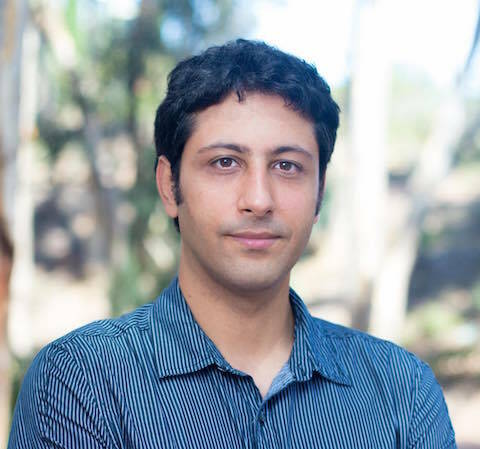 Siavash Mirarab joined the Department of Electrical and Computer Engineering at UC San Diego in 2015 after earning a Ph.D. from the University of Texas at Austin. His dissertation, “Novel Scalable Approaches for Multiple Sequence Alignment and Phylogenomic Reconstruction,” addresses the growing need to analyze large-scale biological sequence data efficiently and accurately. To address this challenge, Mirarab introduces several methods: PASTA, a scalable and accurate algorithm that can align data sets up to one million sequences; statistical binning, a novel technique for reducing noise in estimation of evolutionary trees for individual parts of the genome; and ASTRAL, a new summary method that can run on 1,000 species in one day and has outstanding accuracy. These methods were essential in analyzing very large genomic datasets of birds and plants. Mirarab’s research interests focus on accurate and scalable analysis of large-scale biological datasets. His work particularly focuses on evolutionary biology and computational methods that use genomic data to reconstruct the evolutionary past. He is interested in algorithmic developments that enable us to analyze very large datasets with high accuracy and with reasonable computational demands. These algorithms find application in various areas of computational biology, including multiple sequence alignment, metagenomics, and phylogenetic reconstruction from whole genomes. Before receiving a Ph.D. at UT Austin, he earned a master’s degree in Electrical and Computer Engineering from University of Waterloo, Ontario, Canada, in 2008. He received his bacherlor’s degree in Electrical and Computer Engineering from the Tehran University, Iran, in 2000. In between his studies, he has worked for various companies, including IBM and Cisco. His Ph.D. research has been supported by a Howard Hughes Medical Institute international graduate student fellowship and by Canadian NSERG PGSD awards.